Travel is always on the mind of a photographer. New places, new faces, and new things to capture. Its what drives your mind to stay creative. When you live 90 miles from another country, it makes sense to visit that country. In Key West we have a saying "I live closer to Cuba than a Wal-Mart." We have Cuban influence everywhere you look. So naturally I had to go. At first that talk was just talk. I kept saying, "Im going to Cuba soon" but I never really sat down and created plans. I think I was a little scared. I don't speak Spanish, I was afraid I might be robbed, and its tough to create a planned itinerary. These issues always seemed to keep me from actually making the effort to go. I kept mentioning my desire to go to my girlfriend, and then my buddy George contacted me, and this talk seemed to fruition into a trip. George has been multiple times, and speaks the language, so why not? Every thing lined up, and a trip of a life time was born. We left on a Friday night. We drove through the night from Key West to Miami. First flight out at 615am. I was landing in Cuba as the sun was rising, and before most people were awake. ¡Vamos Cuba! We were met at the airport by our driver for the week. He was our local knowledge. He made sure we got from point A to B. When we wanted a certain Cuban meal he helped us find it. I gave him some of the ideas I had for photography, and he directed me to the location. Being on the trip with my buddy Tim, who is another photographer, was great. We both had different mediums that we wanted to focus on, and were able to share tips and tricks to each other. George was able to point us in the direction of great neighborhoods, our driver got us there the fastest way. I felt like I was royalty. All of this coming together gave me the opportunity to focus on imagery. I had a camera always ready, and a GoPro ready for some video. We stopped off at our Casa Particulares in the Cayo Hueso neighborhood of Havana. Duplex Cervantes was a 2 story condo/apt with 3 bedrooms. Sisters Armelle and Ailyn were there to great us. They both spoke English and 3 other languages. I instantly felt at home. All thoughts of anxiety were wiped away. I ran to the balcony, looked out over Havana and the Malecon, and realized I was in for a life changing experience. Day 1: Havana, Marina Hemingway, and Old Havana at night! We woke up after our first night in Cuba refreshed. We had traveled the entire previous day and hit the ground running. The nightlife was dull due to the country being in mourning. One day before our arrival a Cubana airlines flight had crashed right after takeoff. It made me wonder what they rest of the week was going to be like. Would I not see the real Cuba?? We were greeted as we all made our way downstairs to an amazing spread of breakfast. Fresh fruit, juice, ham, cheese, bread, and coffee. The sisters had come in prior to us waking up and prepared us a meal to start the day. Thats the amazing thing about staying in a Casa Particular. Its someones home, very similar to AirBnB (some are advertised on AirBnB as well), so they treat you as family. That also goes to show how hospitable the Cuban people are. They treat you as one of their own, no matter your skin color, where you are from, or what language you speak. A lesson all of us could learn and prosper from. After breakfast our driver for our 2 day trip toViñales arrived. I walked down 2 flights of stairs to find a 1952 Ford Custom shining in front of me. Original body, seats, and a 3.8 Liter Toyota Turbo diesel under the hood. I knew this was the start to something magical. The only thing I knew was that we were headed to Viñales for some horseback riding, caving, and exploration. 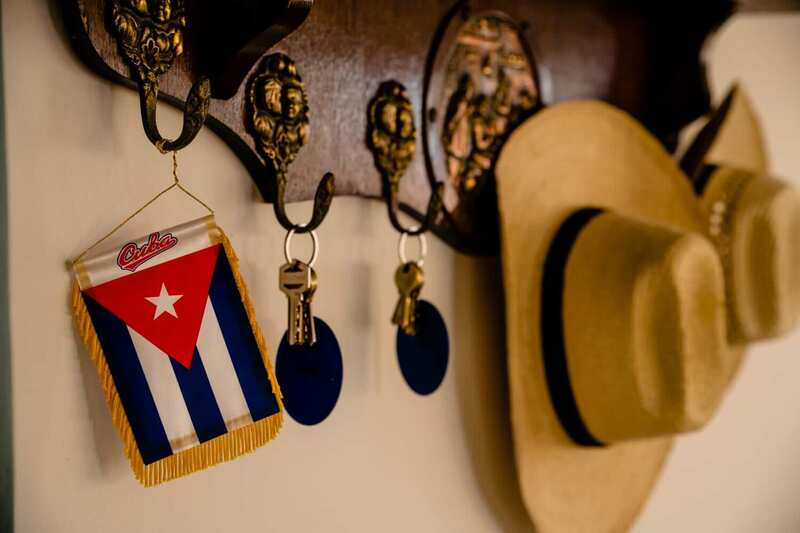 A new Casa Particulares and a new Cuban town awaited. Our day in Viñales was amazing. We rode horses for most of the day through a national forest of Cuba. It rained on us, and we sought shelter at rest area during the ride. We sat down with the workers of that area, learned about their lives, and blew their minds with a voice activated GoPro. Again when we woke up, we were greeted with a delicious breakfast. Emelito and Danay were our hosts. An amazing home, which was practically brand new. Danay was funny as she asked us a few times to review her on TripAdvisor and AirBnb. They were just starting out, and the positive reviews that I will leave will hopefully sustain their business and allow them to prosper for many years ahead. You saw signs of those reviews throughout our drives. Banners showcasing each casa's excellence on one of the travel sites. Cuba started allowing the citizens to form their own businesses, which is hopeful in driving tourism. To me its the only way to stay! We left that morning and ventured to Pinar del Rio. We headed to a natural waterfall area, a biosphere, and had an amazing lunch in the mountains. Every meal seemed to consist of Rice, Beans, Cucumbers, Tomato's, and fresh juice. For my travel mates, there was always a Cristal or Bucanero in their hands, and it was practically frozen. One thing they kept saying was the level of coldness that Cubans keep their beer, COLD! After our excursions we picked up two Swiss travelers who had missed their bus and headed back to Havana. Laughter, rainbows, and the coolest rest area stop I have ever been too. Our last day in Cuba was spent roaming around Havana. I got up early and walked the Malecón grabbing some early morning images. We made sure we saw things we wanted to see. We enjoyed one of the most amazing coffee's I have had in my life at our drivers parents house. We headed into the tourist areas to do the must do's. Floradita, Sloppy Joes, Bodeguita del medio, and the art market. I found art to grace my walls and made my first pintura purchase. A great way to end our trip! We flew home the next morning. The entire flight home I had a smile on my face. I looked out the window as the island nation of Cuba disappeared into white clouds. I could still visualize the smiling faces of the people I met. The laughter from the conversations, the misunderstandings of my attempts on Spanish, and the sincerity of a people I got to know. Everything in Cuba is about hospitality. Everyone wants to give you everything, when many of them have nothing at all. Someone will spend their last CUC or Peso, just to make someone else happy. Its their pride that they want to share. Cuba changed me. I sit back in the comforts of my home, something that I never thought I took for granted until this trip. I complain about things that now have zero relevance. I should be happy that I am alive, that I have a car, that I have comforts in life that I don't necessarily need. My one take away from this entire trip, is my wish to be able to bottle up the Cuban spirit and mentality, and bring it back to the states, and spread it around. We live in a society where we complain if the cable/internet goes out. We complain about what the weather is like. We complain... Take a trip to Cuba, and all that will change. You will not hear people complaining about their living situation. You will not hear them complaining about their job. You will witness people who see the positive in every negative. Happy people who are happy even when they have nothing at all. You will relearn what the meaning of being a good neighbor is. My hope is that you will be changed for the rest of your life, the same way I was! I love your photos and the sentiment of your narrative. I could not agree more! These are awesome pictures of my homeland! I hope one day I can go back & see where I was born….I left when I was only 7….I’ll be 64 next month…..one day I’ll make it there…. I came to your site looking for surf photos from the recent swell in South FL. I am leaving stoked about Cuba from your pics and story. Amazing work. Thank you for sharing. Wow, Michael, your photos are amazing. You make us live your journey like if we were there with you too. Great Job.